So what's hiding in these bags? 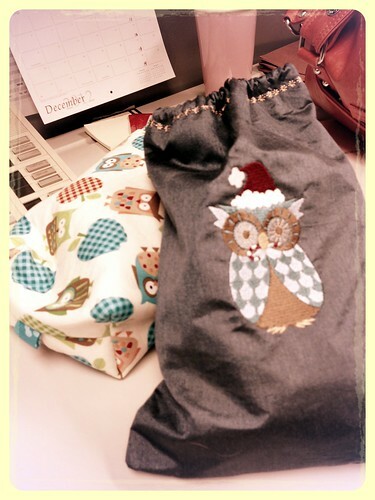 In bag #1, we have my sister's mittens, Glenna C.'s Podster Gloves. These are flip-top fingerless mitts (which I've simplified even further by eliminating the individual fingers), with a flip-top thumb for smartphone use. 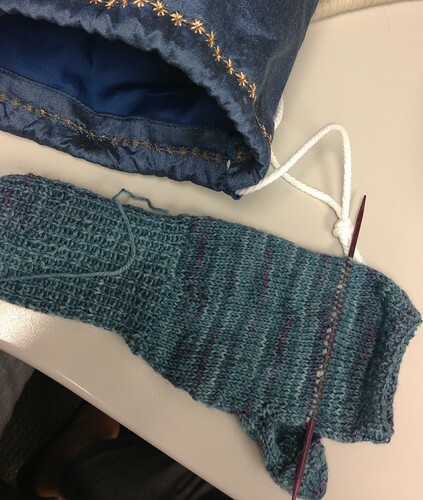 I've reached the point where I pick up stitches for the flip-top on mitten #1, so these need a lot of work yet. 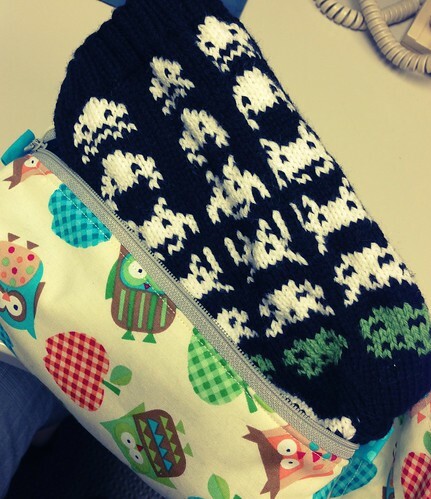 In bag # 2 we find dad's Space Invaders socks, aka, BMP from Knitty. When I went to order yarn for this project, Knit Picks was out of Stroll Sock in the colors I wanted, to I bumped it up to Stroll Sport. In traditional fashion, though, I didn't bother reworking the math for the socks, I'm just kinda winging it. I cast on 78sts, rather than 92, and worked from there. I'm also not bothering with the duplicate stitch "shooter" on the top of each foot, either. Too much work. I've nearly completed sock 1. TODAY I ordered yarn for a final Christmas project. CP really needs mittens, I've decided, and somehow, in my entire stash, I couldn't find a suitable amount of worsted weight yarn. I either have enough for a sweater, or scraps. Nothing in between. So, I ordered a couple of skeins of WOTA Tweed from KP--and nothing else! My entire order was $10, including shipping! It's a Christmas miracle. In other, completely unrelated news, I've started a new project. I really hate when a blog I love about X suddenly becomes a blog about Y. So in the interest of not turning Learner's Per-knit into a blog about childbirth, dirty diapers and teething, I've started a whole new blog. It's called There's No D#$% Stork, and you can find it right over here. It's very much a work in progress, but I expect to write about all the not-so-glamorous moments of pregnancy, childbirth and learning what to do with a baby. All knitting and design work will stay right here at Learner's Per-knit, where it belongs.